With Arestelle set up as an Historian, I soon realized that it’s pretty difficult (i.e. much too expensive for a new player) to use and level the weaponsmith profession without the ability to mine metals oneself. 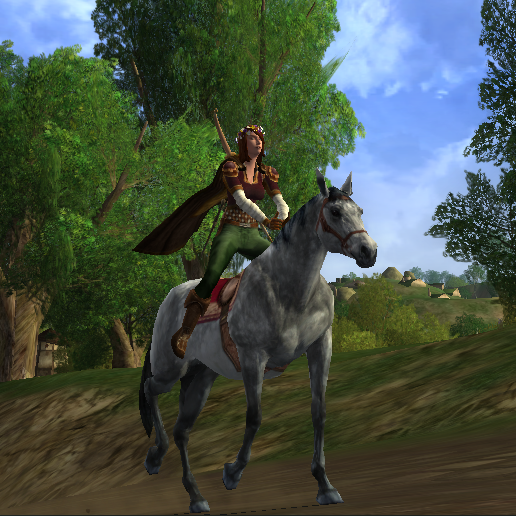 Enter the Explorer: Muiriol, a human champion. She was my second character and vies with Arestelle for most-played (it is pretty fun to run straight into a group of enemies and shing-shing them to dust, after all, especially in contrast to skulking in the shadows and shooting them down one by one, though I like that too). Besides prospecting, she has foresting and tailoring skills that have come in very handy both for Arestelle’s armor and for accessing both light & medium armor pieces for their cosmetic appearance. 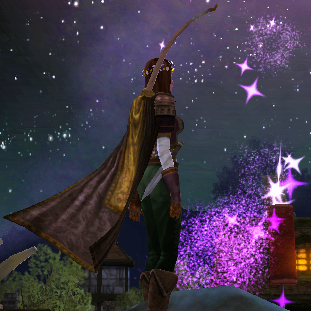 Minor changes – gloves are Hyacinth’s Gauntlets, burgundy, from a quest in the Shire, and the shoulders are the Shining Dwarf Leather Shoulder Guards, burgundy (actual source unknown, but I believe the style is common at vendors). 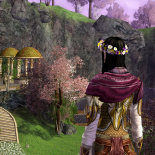 This entry was posted on 2014.03.18 by vyh in Outfits and tagged burgundy, cosmetics, elendilmir, green, lord of the rings online, lotro, muiriol, outfits, rivendell green.